Are We Advancing or in Retreat? A quick scan of recent headlines could leave one with the impression that the Christian Church is in retreat across the globe. Consider these reports taken from the January 2015 e-mail bulletin from Barnabas Aid, a non-profit agency dedicated to the relief of persecuted Christians. As disheartening as these events appear—and they are horrific—we must not allow ourselves to draw the wrong conclusions. We have a tendency to observe the decline of the Church in the West and assume that this must be the case world-wide. But nothing could be further from the truth. The Church is powerfully on the move. Take a look at the chart below. 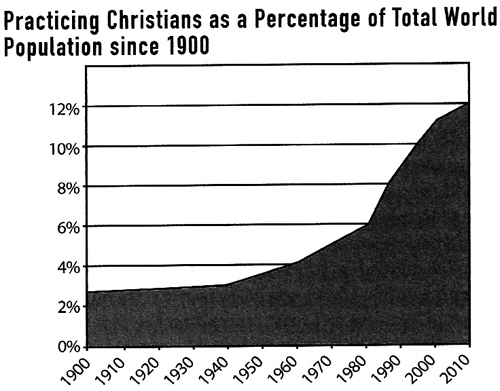 It represents the percentage of “practicing” Christians as a percentage of total world population. These numbers exclude so-called nominal Christians who identify with a Christian tradition but who are not affiliated with a local church. Allow these numbers to sink in a moment. It took eighteen centuries for the Christian Church to reach 2.5% of the world population in the year 1900. That number doubled over the next seventy years to 5%. Between 1970 and 2010 (a mere forty years) that number more than doubled again to 12%. This represents a 480% increase in a little over a century! Let’s look at it another way. The graph below shows the ratio of non-Christians and nominal Christians to practicing Christians from the second century until now. In the second century that ratio was roughly 360 to 1. By 1900 it had declined to 21 to 1. Today it stands at about 7 to 1! This is astonishing growth and seems to fly in the face of what we can readily observe about the diminishing influence of the Church in Western culture. Where is this growth coming from? To help answer this question, consider the next graph. This represents the breakdown among practicing Christians between Western and non-Western nations. 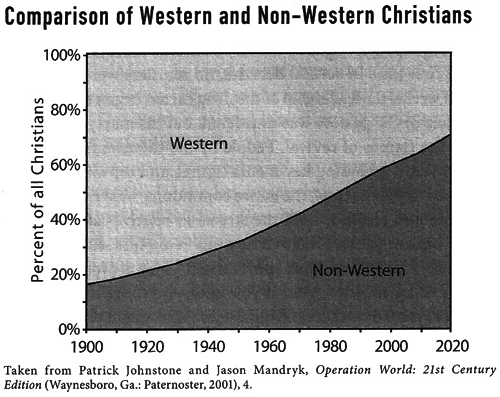 As you can see, the growth of the Church is occurring in the non-Western world. In fact, according to Ralph Winter, the great missions scholar and General Director of the Frontier Missions Fellowship in Pasadena, California, there are now more missionaries being sent out by non-Western churches than from the traditional mission-sending churches of the West. (Koch, 2014) The baton has been passed. The churches of the developing world are now sprinting towards the finish line. The Church in Latin America, Africa, Asia, and the Middle East is experiencing explosive growth. The Church in China has grown from around one million to over eighty million in the last fifty years. Since the 1980s the tiny persecuted Church in Nepal has grown from almost nothing to several hundred thousand. (Koch, 2014) In 1900, South Korean Christians numbered less than 1% of the total population. Today, they are nearly 30%. And these are not isolated occurrences. Whether the increased persecution of the Church is a cause or an effect of this explosive growth is up for debate. I suspect that it is both, depending upon local conditions. But please do not miss my point. I am not saying that we should accept the conclusion that persecution is an inevitable and acceptable by-product of the expansion of the Church in a hostile environment. Our suffering brothers and sisters deserve better. They are entitled to our prayers, as well as our practical and material support. We must confront injustice where we find it. But nor should we see the increase in persecution as the death-knell, or even an interruption, of Christ’s redemptive work on earth. It most assuredly is not. Jesus emphatically stated in Matthew 16:18 “…and on this rock I will build my church, and the gates of hell shall not prevail against it.” What we are seeing today is a dramatic demonstration of the truth of Jesus’ prophetic declaration. We must not allow ourselves to indulge in paralyzed inaction and self-pity. The Church is alive and well and persecution, however dreadful, will not deter the onward march of Christ among the nations! Koch, R. D. (2014). Finishing the Task: The Unreached Peoples Challenge. In Perspectives on the World Christian Movement (p. 531). Pasadena: The William Carey Library. Mandryk, P. J. (2001). Operation World: 21st Century Edition. Waynesboro, GA: Paternoster. This entry was posted in Faith and tagged Christian Church, Christian Persecution, Christianity, Church, persecution. Bookmark the permalink. A very interesting analysis and a most intriguing question. Is the persecution or other violent opposition to any religious, or for that matter racial or political group caused by its expansion or vice versa. It has been my experience of life that strongly opposed or persecuted beliefs/philosophies thrive on that opposition or persecution. Another interesting question for me is – are other religions expanding too and if they are what are they expanding into? Thanks for the thoughtful comment, Andrew. 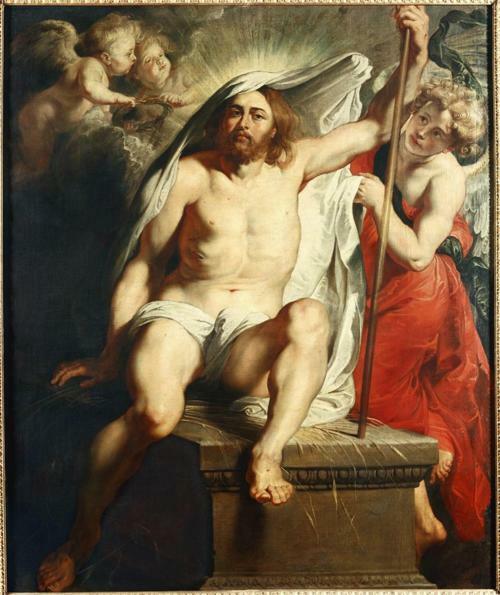 It is true that history has shown that Christianity has a tendency to thrive under less than ideal conditions. Although it is less certain that the reverse is true, the decline of the Church in the West would certainly suggest so. The numbers that I have seen indicate that Christianity has the highest growth rate in terms of real numbers, but Islam has the highest percent growth at just over 2%, compared to Christianity’s 1.4%. This disparity appears to be the result of significantly higher birth rates in predominantly Muslim nations, as Christianity continues to have a higher conversion rate. Cheers. You have presented an interesting analysis of the state of the Church today, James, and supported it with Impressive data. Your points about persecution are of particular interest, as are the links you suggest between the growth of Christianity and birth rates in your comment above. Another very thorough post, as always.. Thanks, Millie. I always enjoy hearing from you. The only study cited here is Koch. How did you arrive at the numbers? For instance, what kind of survey can distinguish nominal Christians from practising Christians….worldwide? You raise a very valid question – one that I asked as well. The short response is that I have not found a detailed discussion of the methodology utilized to estimate practicing versus nominal Christians. The paper cited is largely the work of the late Ralph Winter, former General Director of the Frontier Missions Fellowship in Pasadena, California. You can find it here. 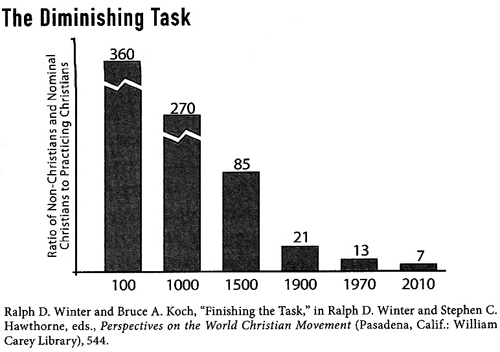 http://www.ijfm.org/PDFs_IJFM/19_4_PDFs/winter_koch_task.pdf. The statistics were prepared by the Lausanne Statistical Task Force in support of its Unreached People Groups project for the Lausanne Committee for World Evangelization. While the data will always be estimates, enormous effort and resources have been expended in the effort and the trends, at least, appear valid. A paper by Patrick Johnstone here http://www.ijfm.org/PDFs_IJFM/07_2_PDFs/7_2Johnstone.pdf will give you an idea of the difficulties involved and the efforts being made to improve the data and the conclusions being drawn from it. Thanks for your thoughtful comment.